The whole of the buildings and land being Lot 1, PS 148686A, Part of Crown Allotment 6, Parish of Noorilim, more particularly described in Certificate of Title Vol. 9604 Folio 117 and chattels as shown in attached schedule Appendix B, held by the Director, HBC. 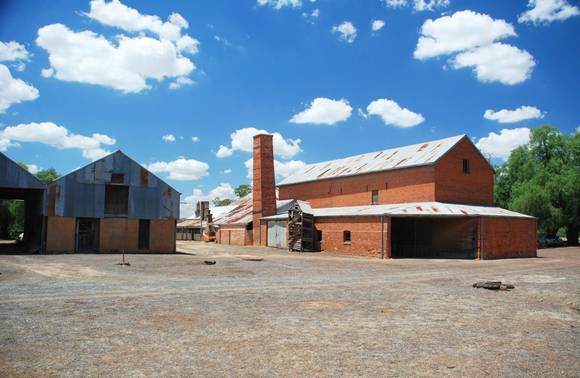 Day's Mill near Murchison, Victoria, is important as an example of a mid-nineteenth century steam-powered flour mill, particularly so for its physical integrity and the retention of original mill technology and artefacts. This large complex established by William Day c.1865 provides an outstanding record of an important manufacturing process at a particular stage of its regional and technological development. The development of new "roller" flour mill technology in the 1880s forever changed the nature of this industry. The growth of the metropolitan market and the railway system, and also the extension of wheat growing regions further north, provided the basis for the concentration of mills in Melbourne and other major centres. Day's Mill is, therefore, a rare and remarkable relic of an important manufacturing process in the pre-1900 period. Day's Flour Mill is still owned by the Day family. A straight tree-lined drive with gatehouse leads to the complex which comprises the three storey brick mill with ancillary boiler structure and brick chimney. There is a two storey brick manager's residence with two storey encircling verandah and several brick, timber and iron buildings. All the original mill machinery and equipment remains. This is one of the finest flour mill complexes in Victoria. It remained in the Day family from 1865 until 1986and has played an important role in the early development of this area. The large complex, complete with all its original machinery, provides an outstanding historic record of nineteenth century milling methods. The local handmade bricks, the tree-lined driveway, the gatehouse and outbuildings are distinctive features. The manager's residence with its fine cast iron decoration and unusual rendered decoration is also important. The Mill was purchased by the Historic Buildings Council in 1986 and transferred to then Department of Conservation Forests and Lands. It has been managed by Parks Victoria since 1996.